Himachal Pradesh, the state blessed with beautiful treks throughout the mountains, has always been the favorite playground of the adventure junkies for centuries. Thrilling mountains of Himachal offers some best trekking trails that differ in their level of difficulty ranging from easy to strenuous. 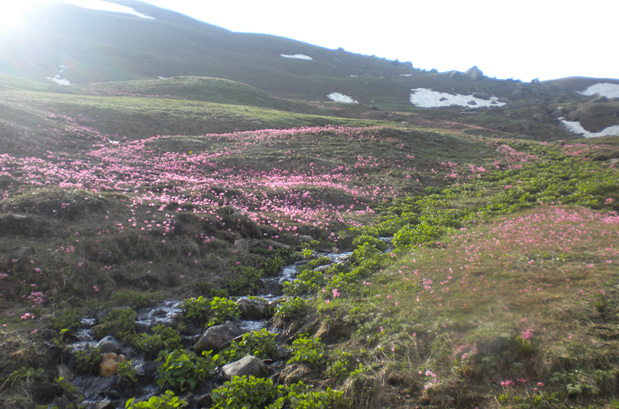 One trek which deserves a special mention in the list of best treks in its vicinity is the exciting 75 km long Deo Tibba. Expansive views, lofty mountains, hanging glaciers, lush meadows, exposed rock faces, giant cliffs extensive geography, these are some of the surprising features of the Deo Tibba trek that fascinate every tourist to visit here once in a lifetime. Views of the snow-capped peaks of the mountains throughout the journey are special, and experienced hikers will say that it's something you need to experience yourself. 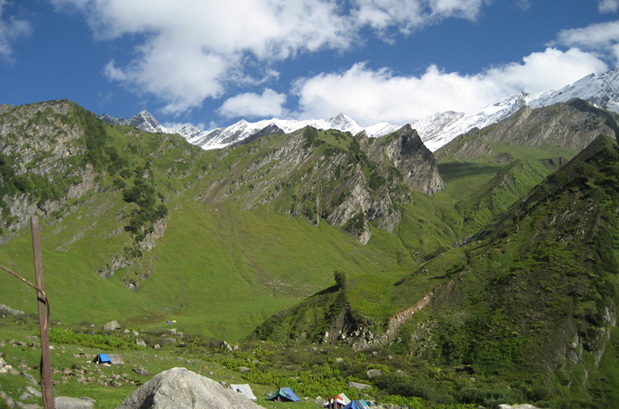 To approach Deo Tibba Base camp, you will cross many remote villages and valleys like Panduropa, Setan, Hampta Pass, Chhika, Piyangniru, Raurikhaudi, to name a few. The trekking trail will take you further to an ancient village called Jogidugh, which is claimed to be the abode of 'Thakshag Nag' (serpent god) and all eighteen 'Nag' Gods. The trek also brings the expeditors to the grazing pastures of the Gaddi shepherds with magnificent views of Deo Tibba peak (6,001 m) and its enormous hanging glaciers. Bhanara cave, which was the abode of Pandavas during their exile, is also an important stopover point for the trek. 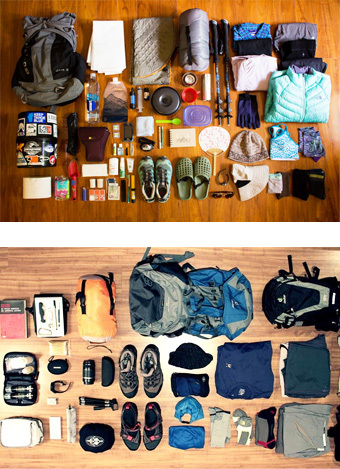 This adventurous expedition will further end at Prini, further embarking on a visit to Manali. 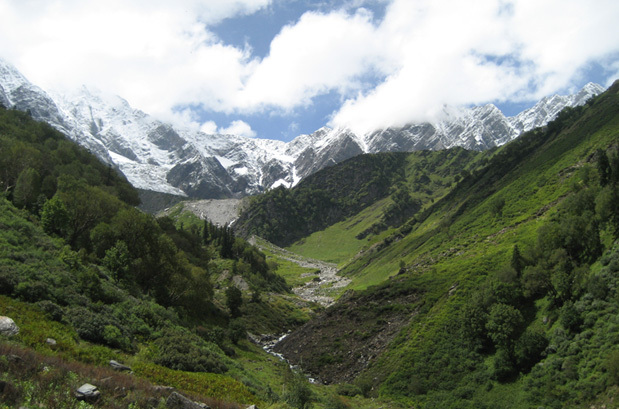 If the idea of trekking to Deo Tibba brings out the vision of scenic mountains and lush meadows and beautiful peaks, then you have indeed landed up at the right place. Mentioned below is the itinerary of Deo Tibba trek, go through it and register now to book your seat. This one of its kind incredible experience is just a click away. Where is the Deo Tibba Trek ? Located at an elevation of 6100 m towards the South-Eastern face of the Manali city, Deo tibba peak is quite famous amongst the trekkers. To reach the hill, trekkers will have to cross ancient villages like Sethan, Panduropa, Rauri kholi, Jogidugh, to name a few. How to Reach Deo Tibba Trek ? By Airways: Bhuntar Airport in Kullu is the nearest airport from Prini, the starting point of our trek. The second nearest airport is Chandigarh International Airport. By Railways: Jogindernagar railway station is the nearest railhead to Manali. Other railway stations nearby the city are in Chandigarh and Pathankot. By Roadways: Manali has a good network of roads which links the major cities - Delhi, Ambala, Chandigarh, Dehradun, Haridwar, Shimla, Dharamsala and Chamba/Dalhousie. On a regular basis, one can see many taxis and buses, run by Himachal Pradesh Tourism, to reach Manali. 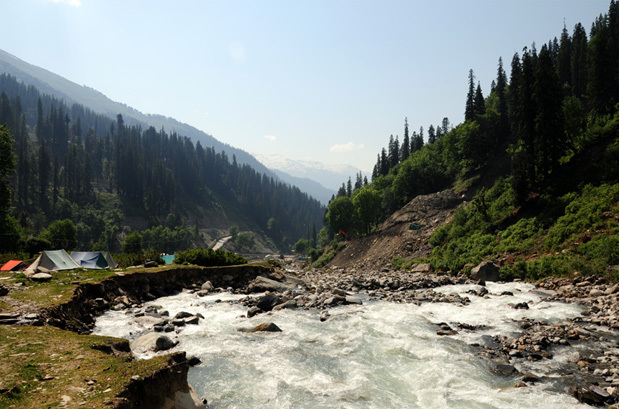 Catch your AC Volvo from one of the meeting points in Delhi to Manali. Overnight Journey. Upon arrival in Manali, you will be transferred to hotel for relaxing. In the afternoon visit Hadimba temple and the evening enjoy at mall road. Explore the charming hamlet and get a whiff of the life of the locals. Overnight stay and Lunch at Manali hotel. Dig into breakfast and get ready for a four-hour drive to Setan village via Prini and Ponduropa. The zigzag motorable trails offer an extensive view of the valley and mountains. Dinner and overnight stay in Setan village camp. 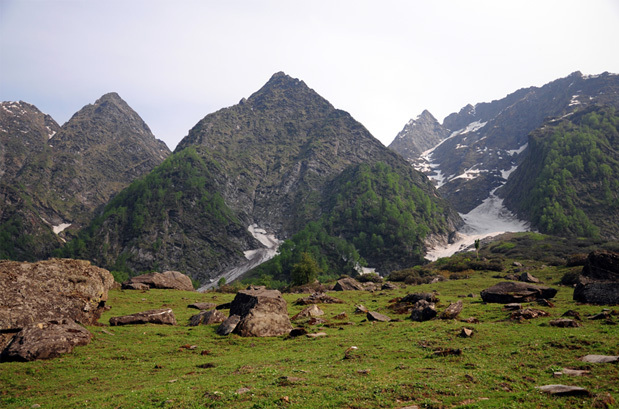 When you start trekking uphill early morning, you will notice lush green meadows that surround the high mountains till the Hampta Pass, a point below the hills. After reaching a certain point, you will trek downhill along the Alian River to arrive at the Chikka region, which is going to be your campsite for the night. The interesting part of this particular trail is that you will see colorful rocks. Dinner and overnight stay in Chikka camp. Cross the river and you will get to see the beautiful view of Indrasan (6,220 m), Deo Tibba Peak (6,001 m), and a group of summits around Beas Kund and Bara Bhangal Region. Overnight stay in the Marhi camp. View of lofty mountains, snow-capped mountains, massive moraine and hanging glaciers will accompany you throughout the alpine trail from Marhi till Piyangniru. Dinner and overnight stay in Piyangniru camp. Now comes the most surprising and tough part of the trek. On this day, the trek trail gets steppers in the beginning till it reaches a point, from where we will trek downhill to Raurikhaudi. Once the trekkers, reach Raurikhaudi, they will notice many shepherds, grazing their herds of Sheep and Goats. Dinner and overnight stay in Raurikhaudi camp. On eight day, you will trek for four hours till Jogidugh, a small village that holds a special mention in Hindu mythology. Jogidugh is claimed to be the abode of 'Thakshag Nag' (serpent god) and all eighteen 'Nag' Gods. Dinner and overnight stay in Jogidugh camp. After breakfast, you will follow the tree lines, which first goes a little down and further climb along the stream. 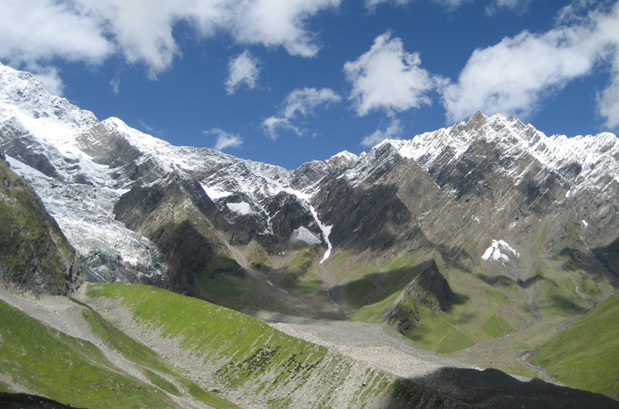 Following this, climb uphill till you reach Tilgan, a place from where you can relish the panoramic view of Manali. Overnight stay in Tilgan camp. Rise and shine, today you will trek downhill to Bhanara, a village known for an old temple and historic cave. Claimed to be the abode of Pandavas during their exile, the cave holds a strong mythological connect. After few kilometers, you will start noticing motorable roads, where our drivers will be waiting for you to drive back to Manali. 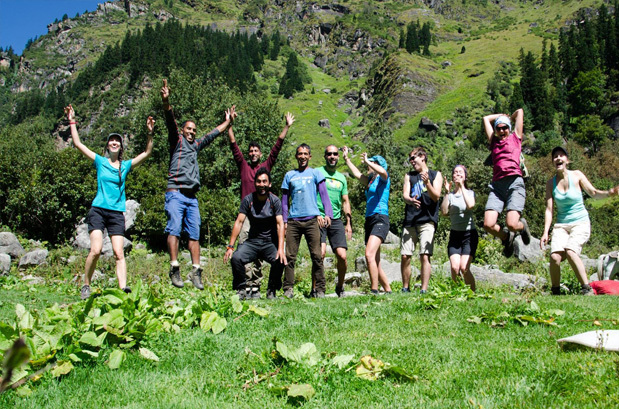 Celebrate your successful trek in Manali. Board your AC Volvo and drive back to Delhi. Overnight journey. Arrival in Delhi marks the end of Deo Tibba Trek. When to book Deo Tibba Trek? 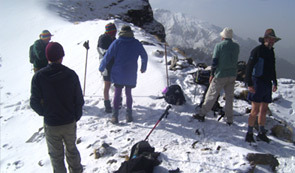 You should book Deo Tibba Trek well in advance so that you get ample amount of time to prepare for the trek. Janpath (Delhi), RK Ashram Metro Station (Delhi) and Majnu Ka Tila (Delhi) are the three meeting points for the Friendship Peak trek. From the meeting point, you will board a bus to Manali. At Manali bus stop, you will meet our agent, who will guide you throughout the tour. 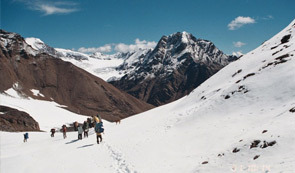 From start till the end, every turn of the trek will be led by experienced guides, who are also expert mountaineers. 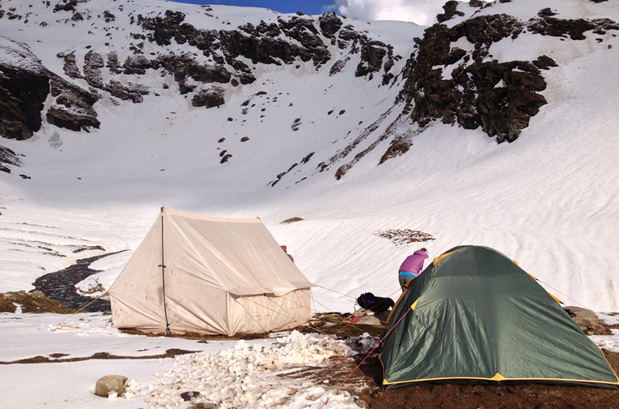 What is minimum age required for Deo Tibba Trek? 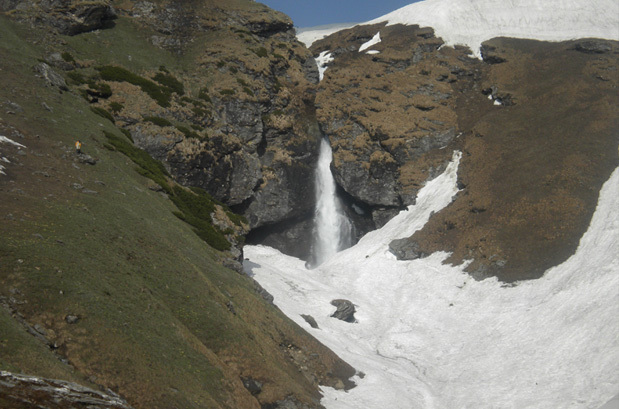 The Deo Tibba Trek is a moderate trek with a maximum altitude of 13000ft (3950m) minimum age required is 10 years. 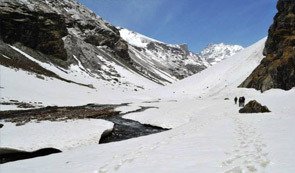 What will be the minimum temperature during Deo Tibba Trek? HHow monsoon affects the Deo Tibba Trek? Deo Tibba Trek is open in the months of May, June, July, August, September and October, which are the full monsoon months as the high altitude regions, remain unaffected from the monsoon. How long we trek during Deo Tibba Trek? In a day, we intend to travel for 6 hours around lunch time, covering a distance of 8-12 km. If we have to extend the trek because of the reasons which are beyond our control, then additional charges will be applied for a hotel stay and food.